Bad things happen to all of us. You might have recently received bad news or gotten a bad grade. What do you do when bad things happen? The answer from the Bible is always the same- don’t worry, pray. We pray because nothing is too big or too small to give to God in prayer. We often try to work things out on our own and sometimes make things worse. That’s why we need to come to God about what to do. But here’s the catch. We have to turn off the phone, turn off the music, get alone with God and quiet enough to hear Him speak . “With thankful hearts offer up your prayer and requests to God” Philippians 4:6b . Before the request- stop and thank Him for who He is, what He has done for you. Amazingly, you will sense His presence. Then out of respect ask Him your request. Too often we barge in right away with a request- instead of taking the protocol of this verse. Thank Him- worship Him and then ask Him for the request. 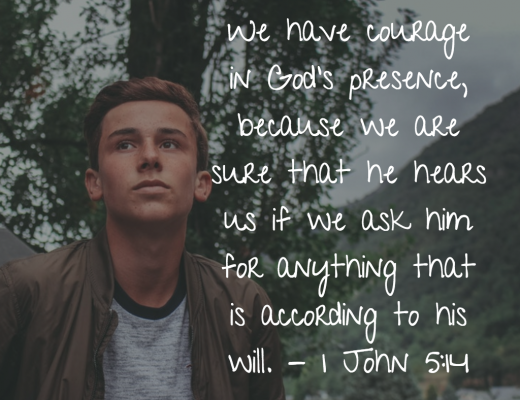 Then be quiet and listen for His answer. And when He speaks it won’t be loud either. Sometimes when you get quiet and get the problem out of your mind and just tell God you love Him and need his help- then out of your heart will come a thought or a picture of what to do. His answer might surprise you. It might be – just pray for the person and don’t say a thing. Or it might be “just take them a cupcake”. Or it might be “just study”. Or it could be a scripture that comes to mind. Whatever it is act on it. Choose today to do what this verse says. Spend time going to God for help when you need it, it will make a big difference in your life.